Grinkers Arcade | Eagle Idaho Real Estate | Think Alei. When I meet people who have not visited Eagle before, I like to show them around town. One of my favorite places to take them is Grinkers Arcade – located near downtown Eagle across from Albertsons. It’s a 1980’s-style arcade with over 300 games, including some of my favorites Donkey Kong, Pac Man, Pole Position, Centipede, Space Commander, Galaga, and many others. And, like in the days of my childhood the games can be played with a quarter. 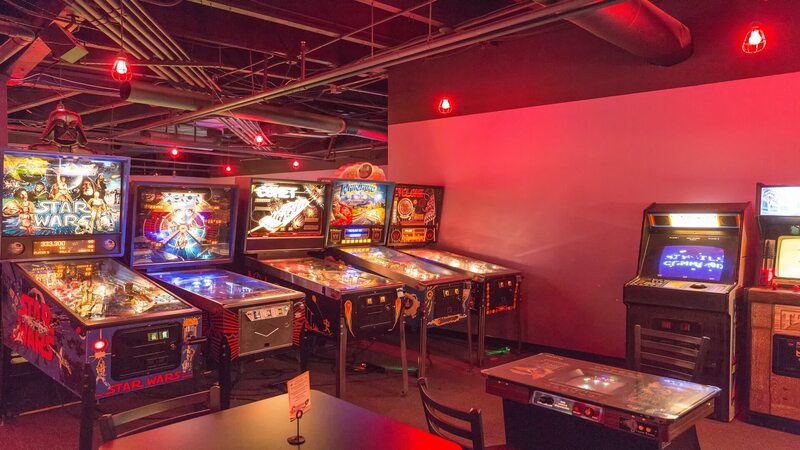 Grinkers offers a good selection of beer, food, ice cream, and wine (and two big-screen televisions for watching sports) making it different from most arcades. Since opening in 2012, Grinkers has expanded three times and has welcomed visitors from over 25 countries who fly in to play the classic games in a classic setting. Grinkers is home to many rare games including a range of 1970’s “black and white” models – including one of two remaining 1977 Star Cruiser editions and a Missile Controller cockpit with the lowest serial number in existence “007”. As soon as they can locate all the parts, the Grinkers staff is expecting to add “Computer Space” to the collection; one of the first four-poster video games made. Some people from Colorado, who were visiting this week, were treated to a lunch at Yumm Cafe! and then an hour at Grinkers. According to the owner, the thought for Grinkers came in the summer of 2011 when he observed school-aged kids hanging out in the Albertsons parking lot. Inspired by the arcades of his childhood, he made it his mission to provide them something fun to do. Now, Grinkers entertains people of all ages, from school-age children to people in their 90’s, many looking to relive the nostalgia of their childhood. Grinkers has many multi-player games, such as Rampart and Gauntlet, ideal for friends or families wanting to play each other. Two weekends out of this month, Grinkers hosts arcade tournaments that attract many players. The employees say that Grinkers is a “labor of love”, with many of them donating dozens of hours each month to maintain the games. I have taken my kids here many times, and every time is a unique experience. It’s fun for me to reminisce about when the very first arcade games came to Eagle in the early 1980’s. Back then our town’s population was only a couple thousand, and there was complete separation between Meridian and Boise. Places like Grinkers are why I love living and working in Eagle.